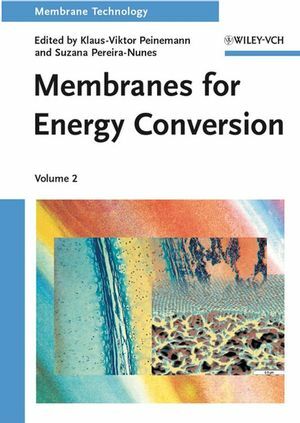 Focusing on recent developments in innovative energy conversion, this second volume features emerging applications with the capacity to transform the entire energy economy. Specific examples include the development of sulfonated polyarylether-type polymers as proton exchange membranes for high- and medium-temperature polymer electrode fuel cells (PEFC), with an entire section devoted to the rapidly expanding field of materials development for solid oxide fuel cells (SOFC). The result is a detailed and invaluable source of information for those involved in the chemical, material science and engineering fields of power generation. K.-V. Peinemann is currently a Senior Scientist at the GKSS Research Center Geesthacht, Germany and has worked in the field of membrane science and technology for 25 years. He has published some 80 papers in international journals, holds 15 membrane related patents, has been responsible for the organization of numerous international workshops and since 1995 has been lecturing on membrane formation at the University of Hanover. From 2002 to 2004, Professor Peinemann served as the President of the European Membrane Society and he is a co-founder of the membrane company GMT Membrantechnik in Rheinfelden, Germany. S. P. Nunes is currently the Head of Department of Polymer Technology at the GKSS Research Center Geesthacht, Germany. She has been working on the development of polymeric materials and membranes for different applications, including ultra- and nanofiltration and gas separation, for more than 20 years, and has authored over 65 papers in international journals in addition to 100 contributions to congresses. Over the last four years she has dedicated her time to membrane development for fuel cells, coordinating German and European Projects in this field. Prior to her current position, she was an Associate Professor at the University of Campinas, Brazil, a research scientist at Pirelli, and Humboldt fellow at the University of Mainz, Germany.